The Montgomeryshire Canal was built as far as Garthmyl in 1794-7. The Western Branch to Newtown opened, at the instigation of William Pugh of Brynllywarch, in 1819. The coming of the canal opened the town to the wider world. This helped stimulate the rapid expansion of the flannel weaving industry that came to characterise early 19th century Newtown, enabling it to function as an industrial centre rather than a remote market town. For many years the canal was busy with boats bringing limestone and coal into the area, and taking timber and flannel out. Passengers too! From 1835 it was possible to travel to London by canal boat. The completion of the railway in i860 led to the gradual decline of the canal although it continued in use until 1944. Much of it was subsequently filled in but many clues to its existence survive to this day. This level three-mile walk through the beautiful Montgomeryshire countryside will reveal some of the hidden history of Newtown's industrial past It is part of the Severn Way Walk and National Cycle Path 81. Loading and unloading canal boats is thirsty work and as soon as the canal opened several pubs were built around the canal basin. 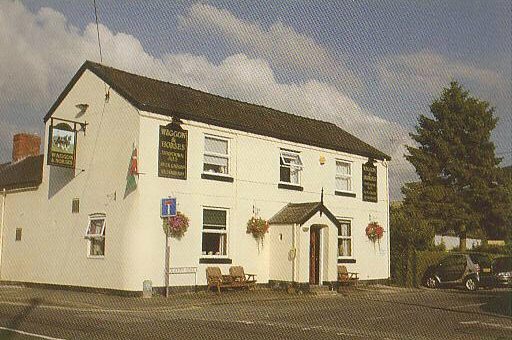 The Waggon and Horses, which still survives, is an appropriate starting point for our walk. You may wish to take refreshment before starting out! Turn left outside the door of the Waggon and Horses. About 50 yards along the lane is a fragment of the brick abutment wall of the bridge which crossed the canal as it reached the canal basin. This was situated in the area to the right which was subsequently built over. Continue past the bridge and take the footpath which leads on to the flood bank alongside the river Severn. You will pass a bungalow on your left which stands on top of the old lime kilns. Turn left along the top of the flood bank. The canal lay to the left, and from here on the walk follows the route of the canal towpath. The line of the canal defined the boundaries of the properties seen to the left. 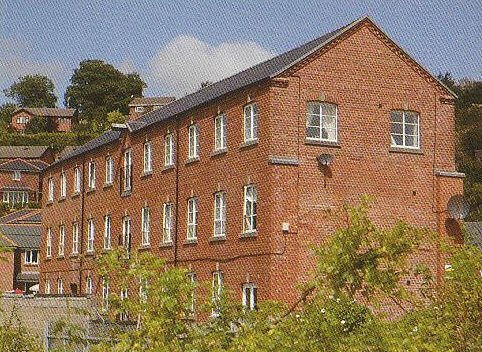 Look out for the wool warehouse, now converted into flats, which is all that remains of the Commercial, or Kymric flannel mill. Some of the stonework of the canal wharves can be seen. 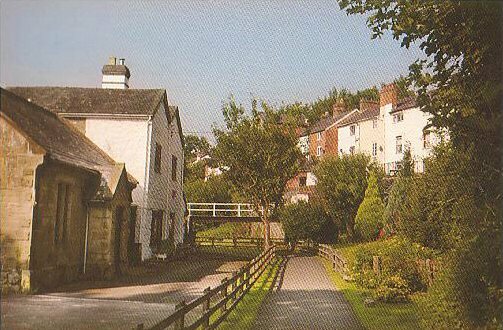 Further along you will see a four-storey row of double-decker canal workers' cottages. Continue along the path through the gateway, where the canal is squeezed between the hillside and the river. Carry on under the old footbridge towards the Pump House. In the summer this part of the canal bed can become rather overgrown. The Pumphouse from across the Severn. The Pump House took water from the Severn to supply the head of the canal. It was originally operated by a water wheel, later by steam and eventually by a diesel engine. It ceased operation in the 1940s. From this point on the path continues between the canal bed and the River Severn. 2. 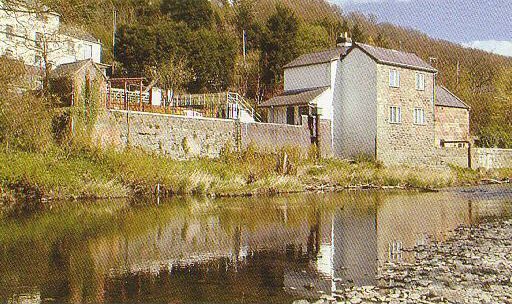 LLANLLWCHAIARN AND THE ROCK LOCK. Continue along the towpath, past the finger-post for about a quarter of a mile. back to the 6th Century, can be seen through the trees on the left. Carry on under the brick bridge, which once crossed the canal, until you reach the site of the Rock Lock. Little of the lock can be seen but you will notice the change in the level of the ford which was the main river crossing for the district before Newtown was founded in 1279. After about ten more minutes, just beyond the metal gate, you will see an abandoned timber-framed house which stood by the canal, with a wharf to cater for the agricultural use of the canal - lime in, timber out. 3. DOLFOR LOCK TO FREESTONE LOCK. The path continues through another gate, then alongside the water treatment works on the right. The remains of an iron bridge over the canal can be seen through the foliage on the left. Carry on through the wooden gate. About 200 yards further along you will reach Dolfor Lock with its little wharf beyond the bridge. Almost all its stone and brickwork is intact. Look out for the lock-keeper's hut. Just below Dolfor Lock a wharf and warehouse buildings can be seen. 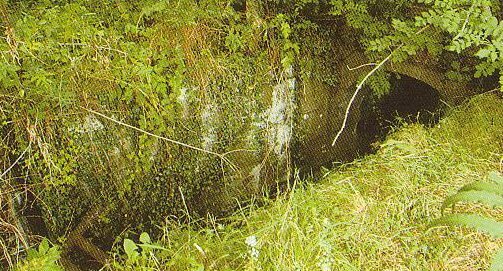 Much of what survived of the canal from Newtown to the water treatment works was destroyed when the town's main sewage system was installed in the 1970s, but from Dolfor Lock on the canal is untouched - except by time. The canal now runs in a straight iine towards Freestone Lock where you will also see the remains of two lock-keepers' cottages in the trees. Beyond this lock the canal has a continuous supply of water. 4. PENARTH WEIR AND PWLL PENARTH. At Freestone Lock turn right, follow the path through a gate and continue alongside the leet, the channel which brings water from Penarth Weir to feed the canal. 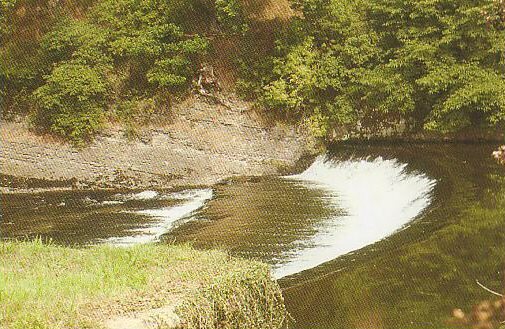 The weir across the river was built with a salmon leap which can be seen from the path. On the far bank of the river are the recently planted Penarth vineyards. 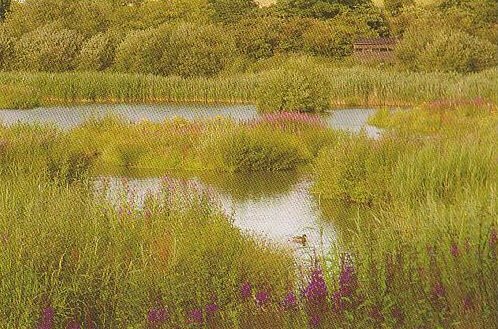 For the return journey you may either retrace your steps from this point, or carry on into Pwll Penarth nature reserve where you may wish to explore for a while and watch birds from one of the hides. A path leading past the hide brings you back through the reserve onto the towpath for the return walk to the Waggon and Horses. For several decades now, teams of volunteers have been working with British Waterways to restore the Montgomeryshire Canal from its junction with the national network at Welsh Frankton all the way to Newtown. Many lengths of the waterway are now navigable but these are separated mainly by "dropped bridges", bridges over the canal that have been demolished and now form a blockage. Restoring these bridges is expensive and will take some time, but eventually it will be possible to reach Freestone Lock, if not beyond, from Welsh Frankton. If you would like to help with this work please contact: The Shropshire Union Canal Society at tigger.bounce@virgin.net or ring Mike Friend on 01948 880723. 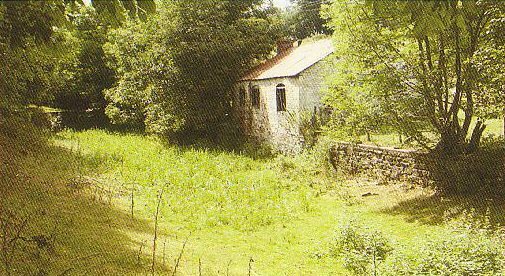 The Archeology of the Montgomeryshire Canal by Stephen Hughes. Royal Commission on Ancient and Historic Monuments of Wales. The Waggon & Horses, your starting and finishing point. 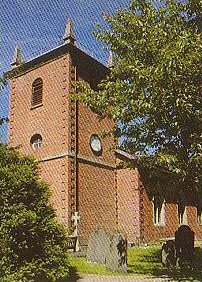 kind permission of the Newtown and District Civic Society.